The holidays are a magical time filled with equally magical stories. Perhaps one of the most beloved and timeless holiday tales is Charles Dickens’ A Christmas Carol; a story about one man’s incredible journey towards a change of heart and the power of the spirit of Christmas. The original is a beloved holiday classic that has stood the test of time, but have you ever wondered what became of Scrooge, Marley, and all the other characters after December 25th? As we head into December, Footlighters Theater’s production of The Trial of Ebenezer Scrooge, which opened this weekend, is the show to see for those looking to get into the holiday spirit. Before the lights go down, you’ll be treated to a performance of classic Christmas carols. Members of the cast don their costumes and serenade the audience with renditions of “Oh, Come All Ye Faithful,” “Hark, The Harold Angels Sing” and other songs from the era of Dickens. The Trial of Ebenezer Scrooge is writer Marc Brown’s attempt to forge a sequel worthy of the original 1843 work. Here’s the premise: One year after being visited by the three spirits of Christmas Past, Present, and Future, Ebenezer Scrooge has returned to his old grumpy, penny pinching ways. As a result, Scrooge takes the ghosts to court and sues them for “breaking and entering, kidnapping, slander, pain and suffering, attempted murder and the intentional infliction of emotional distress.” The show follows the courtroom recounting of the nights of the previous year, with some additional antics and banter added in. The show is a meta take on a story that’s been told thousands of times over the years. Much of the dialogue comes directly from the original story. It’s a nice way to blend the classic and contemporary elements of both stories and an enjoyable attempt to add some comedy into the mix. Pete Rolston does well in his portrayal of Scrooge. Often the smallest nuances can change the quality of an actor’s performance. The scoffs, downturned scowling and cane tapping make Rolston’s performance fairly convincing. A modern twist of timeless holiday classics, Footlighters’ rendition is one to catch for those looking to shake up their holiday routines. 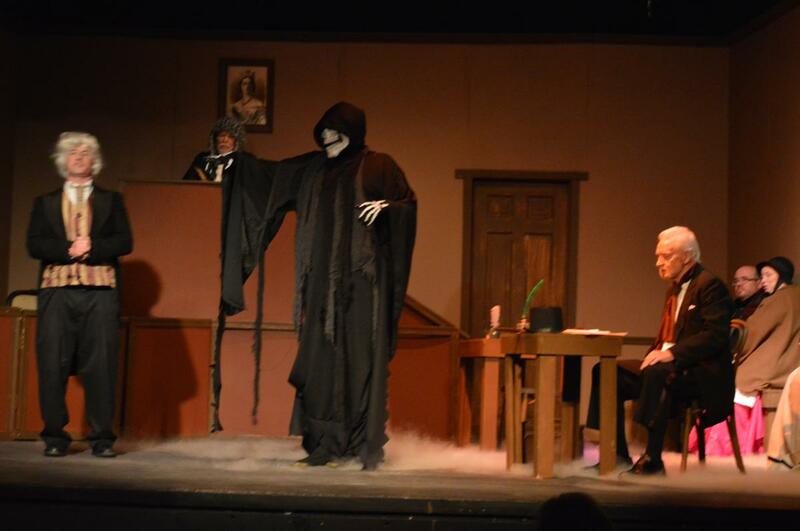 The Trial of Ebenezer Scrooge runs through December 16th. December 8, 9, 15, 16 at 8 p.m.